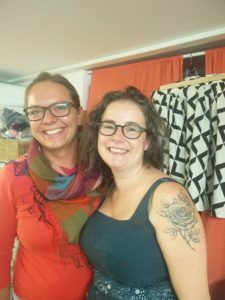 No Time To Sew has been born out of my passion for sewing and sharing the knowledge with our local community in the south of Spain. It may have been somewhat inspired by my mum being a seamstress for many years of her life. However, when I have asked Santa for my first sewing machine few years back, I didn't have a clue how to thread it, which lead to many frustrating attempts to get it going. Finally... defeated by my Singer Talent, I posted on local facebook group for help. One very helpful soul has directed me to Gibraltar College sewing classes with lovely Caroline, who has been, and still is, an inspiration and tremendous help me to get started. Having caught the sewing bug for real, I have started sewing during the weekends, after work, creating more and more elaborate creations. Once a year, I have been going to London for workshops with Charlotte "the bunny slippers" Newland, the 2016 GBSB winner. She has been such a laugh, encouraged me to follow my passion for sewing and taught me all the shortcuts I am now ready to pass on. My site is called No Time to Sew, as I'm all for fast results and immediate effects. We have so little precious free time for our hobbies that we need to maximise it. I'm keen for you to learn all little tricks that helped me to avoid tacking and come up fort first class makes. Our classes and studio hours are available to sewists at all level, with themed workshops throughout the year (e.g. mother & daughter crafting sessions, Valentines and Halloween creations). Weekend & afternoon courses will hopefully allow you to use some time from your busy schedule and dedicate it to crafting. We also offer one to one tutoring at the comfort of your own home, so you can gain confidence in your skills without leaving the house. There is no better way to create a new item, but in good company of like-minded, creative people, so if you like to perfect your skills, gain new friends or simply try sewing for the first time, join us at the next class or workshop. Please share your makes on our dedicated Your Makes Page.